For users of the Heat Transfer Module, COMSOL Multiphysics® version 5.3 includes new functionality to model heat and moisture transport in air, a new solver for modeling heat transfer in the frequency domain, and heat sink geometry parts to more easily create certain geometries. Learn about these heat transfer features and more below. COMSOL Multiphysics® version 5.3 includes several features to further extend the modeling of heat and moisture transport in air. A Moist Air feature is available in the Heat Transfer in Moist Air and Moisture Transport interfaces. This feature handles moisture transport by convection and diffusion in air as well as turbulent mixing caused by eddy diffusivity when you need to account for turbulent moisture convection. The two interfaces can be coupled using the Heat and Moisture multiphysics feature. In this case, moisture and heat transport in air are automatically coupled in domains where building materials are defined. Water condensation and evaporation on surfaces may also play a significant role in applications simulating moisture transport in air. Not only do these mechanisms influence the material balance between vapor and water, but they also greatly influence the energy balance due to latent heat. This is now easier to account for using the Wet surface and Moist surface boundary conditions. The modeling of the evaporation of water in a glass due to warm, dry airflow is greatly simplified using the predefined features for heat and moisture transport. The modeling of the evaporation of water in a glass due to warm, dry airflow is greatly simplified using the predefined features for heat and moisture transport. When subjected to periodic sinusoidal heat loads at a given frequency, the temperature response of a body can be assumed to be periodic, sinusoidal, and of the same frequency around an equilibrium temperature. This time-dependent periodic problem may be replaced by an equivalent linear steady-state problem in the frequency domain, which is far less computationally expensive. The heat transfer interfaces now support a Frequency-Domain Perturbation solver that computes the harmonic temperature variations around an equilibrium state. 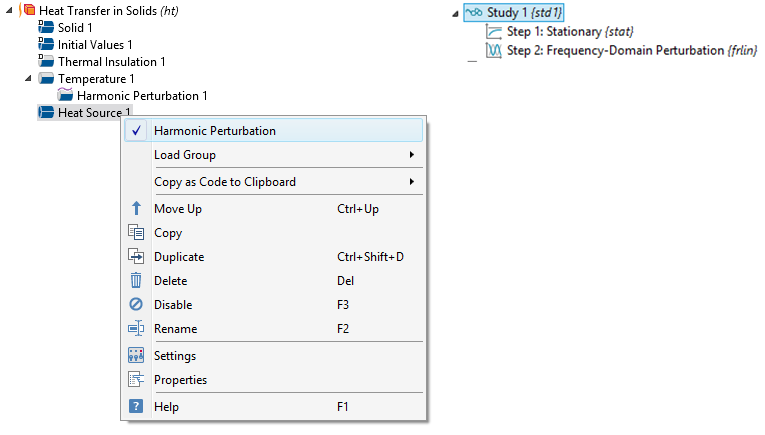 Additionally, a Harmonic Perturbation subfeature can be added under the Temperature feature for prescribing harmonic variations. The Heat Source and Boundary Heat Source features can also act as perturbation loads if the Harmonic Perturbation option is selected. A classic way to cool a device is to attach a heat sink to it, which is sometimes combined with a fan to enhance the cooling. 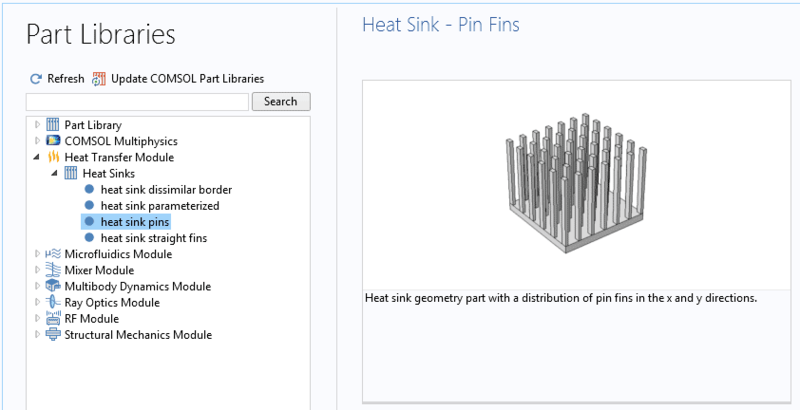 The Part Library in the Heat Transfer Module now contains different parameterized geometry parts for heat sinks with pin fins, straight fins, or pin fins with dissimilar dimensions on the borders. These new parts make it easy to include a heat sink in any model. The heat sink part selections in the Heat Transfer Module's Part Library, where a heat sink with pins for cooling has been selected. The heat sink part selections in the Heat Transfer Module's Part Library, where a heat sink with pins for cooling has been selected. 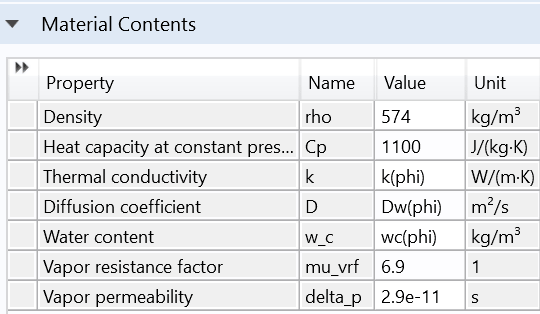 A Building Material Library, which is now available with the Heat Transfer Module, provides typical hygroscopic and thermal properties of materials commonly used in buildings. 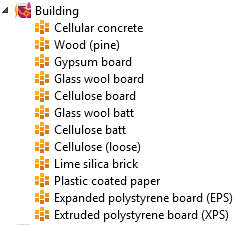 These materials make it possible to quickly set up heat and moisture models using realistic material properties for building materials (see image). Material properties include heat capacity, thermal conductivity, density, water content, vapor permeability, etc. Additionally, two new refrigerant materials have been added in the Liquid and Gases material database: R-134A and R-22. When a material is exposed to high or low temperatures, its composition may be irreversibly transformed. Part of this transformation energy may be consumed or released as a consequence of the material change or chemical reaction that has occurred. The Irreversible Transformation attribute, available under the Solid domain node, is defined to model such thermally induced, irreversible transformations. This feature implements a Temperature threshold or an Energy absorption model to account for the transformation. Then, the generation or loss of heat during the transformation can be accounted for in the energy balance through defining enthalpy change. 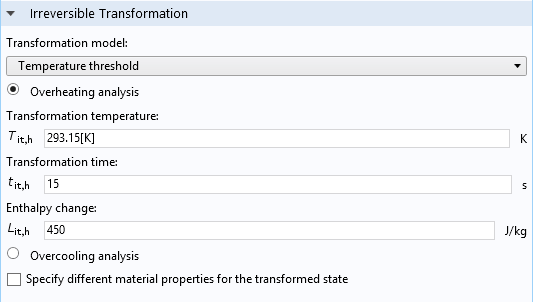 Finally, you can define different thermal properties for the transformed state. When using the finite element method, your element choice can play a key role in the accuracy and performance of your simulation. Serendipity elements have now been introduced for heat transfer applications, which include an alternate (serendipity) shape function. This means that for a given order of element, the serendipity shape functions require fewer computational resources than the equivalent Lagrange shape function. The Lagrange shape function is generally more accurate than the serendipity shape function. The two functions are identical for tetrahedral and triangular meshes. The Symmetry for Surface-to-Surface Radiation global feature contains new options available for 2D and 3D models when either a Heat Transfer with Surface-to-Surface Radiation interface or a Surface-to-Surface Radiation interface is active. This new feature can be used to take advantage of multiple symmetry planes in order to reduce the mesh size and requires fewer computational resources. In 2D models, two perpendicular planes can be defined. In 3D, you can define either two perpendicular planes with an intersection parallel to one of the axes or three perpendicular planes parallel to the axis. Additionally, in the Symmetry for Surface-to-Surface Radiation global feature, you can visualize the plane(s) of symmetry in the Graphics window along with the geometry. This is meant to make it easier when defining the plane(s) for all types of symmetry. A check box is available to show/hide the planes in the Graphics window. 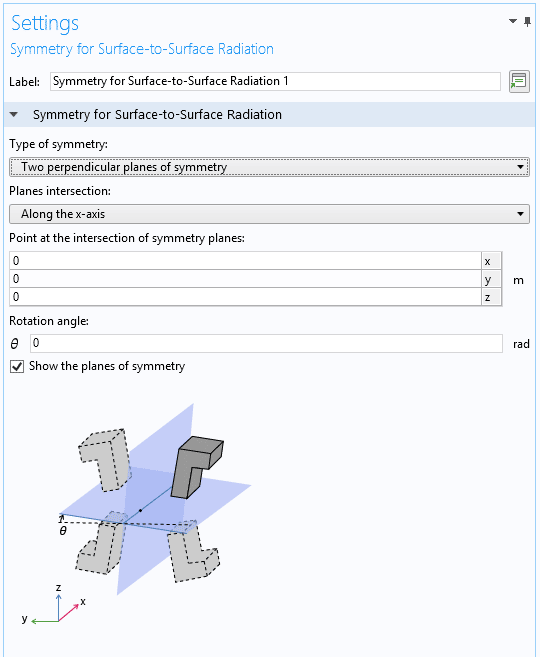 The user interface for the Symmetry for Surface-to-Surface Radiation feature with the Two perpendicular planes of symmetry option selected for the type of symmetry. For most convective cooling simulations, you need to compute the heat transfer in the surrounding fluid together with the flow velocity. However, when the heat transfer coefficient is known for the convection component of the studied configuration, you can achieve good accuracy with low computational cost by modeling the heat transfer in the solid phase only and using heat transfer coefficients at the boundaries. This capability has been available in previous versions of the COMSOL® software when choosing the Plate, averaged transfer coefficient or Plate, local transfer coefficient options in the Heat Flux attribute when the Convective heat flux attribute is selected. 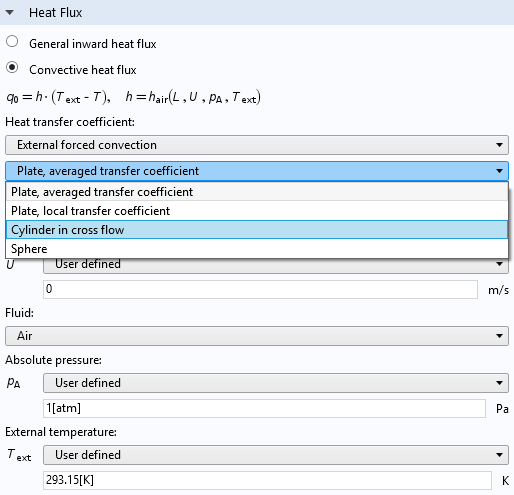 Now, two additional options for a Cylinder in cross flow and a Sphere are available when defining the heat transfer coefficient in the External forced convection drop-down menu. 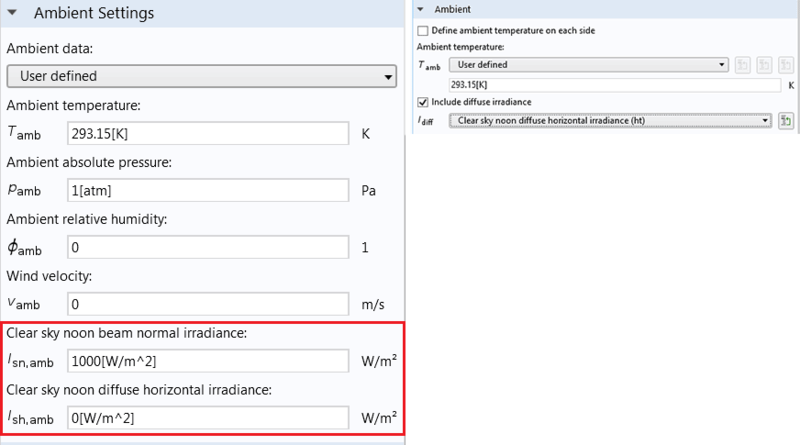 When using the Diffuse Surface and Diffuse Mirror features in surface-to-surface radiation models, you now have the option to account for diffuse solar irradiation. In the Ambient section of the Settings window of these features, you can select the Clear sky noon diffuse horizontal irradiance option when you have selected Include diffuse irradiation. This contribution is added to the direct solar irradiation (sun rays directly striking the surfaces) defined by the External Radiation Source feature and Clear sky noon beam normal irradiance option. Both of the solar irradiation properties are defined in the Ambient Settings section of the physics interface. In the Fluid feature of heat transfer interfaces, the Equivalent Conductivity for Convection section provides a new option, Automatic, for evaluating the temperature difference in the Rayleigh number when choosing Nusselt correlations for the Horizontal cavity heated from below and Vertical rectangular cavity options. The software automatically determines the temperature difference by finding the difference between the maximum and minimum temperature of the domain boundaries. The Thermally thick approximation option in the Thin Layer feature now accounts for a time-dependent term that models time-dependent energy storage. 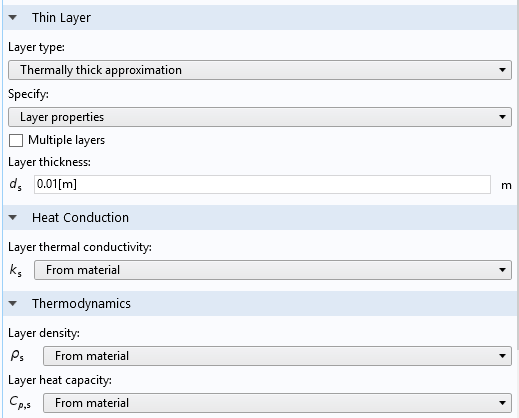 Additional material properties for the Layer density and Layer heat capacity need to be defined in the Thermodynamics section for the time-dependent term. This feature improves model accuracy when the heat capacity of a thin layer is large compared to the surrounding materials. The Thin Film and Thin Layered Shell features now include new functionality that was previously only available for the Thin Layer feature in the Heat Transfer in Solids interface. This provides a Heat Source subfeature by default as well as an External Temperature subfeature, which is made available by selecting General as the Thin film model in the Thin Film Settings window. In the Heat Transfer in Thin Shells interface, the Thin Film feature contains the External Temperature subfeature with an additional option to provide Upside and Downside temperatures. The Thin Layered Shell feature, in the same interface, contains both the Heat Source and External Temperature subfeatures, including the Upside and Downside temperatures. Settings for the External Temperature feature provide options to control the external temperature on each side of the shell. There are three new improvements to the Ambient data functionality, where the user interface for the External Radiation Source has been synchronized with the Ambient Settings functionality. 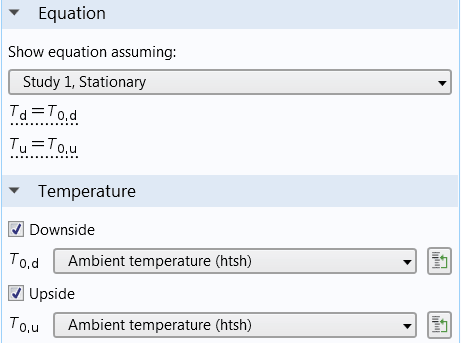 Additionally, the ambient temperature has been added as a feature input in the Isothermal Domain feature when the Temperature definition option is set to From prescribed temperature. Finally, all of the ambient data variables are now available as global variables and can be used in a global evaluation for postprocessing purposes. A new tutorial model uses a heat sink geometry from the Part Library. 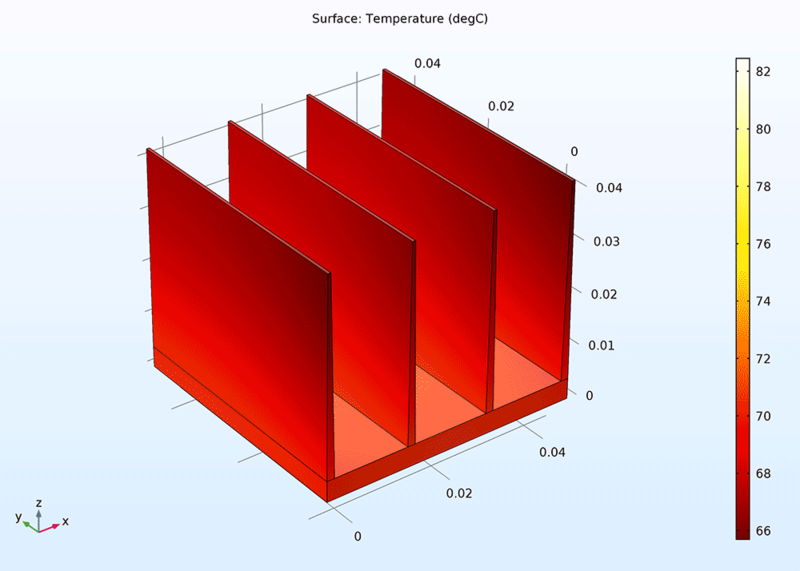 The tutorial shows different approaches to heat transfer modeling when studying the cooling of an electronic chip. In the first part, only the solid parts are modeled, while the convective airflow is modeled using Convective Heat Flux boundary conditions. 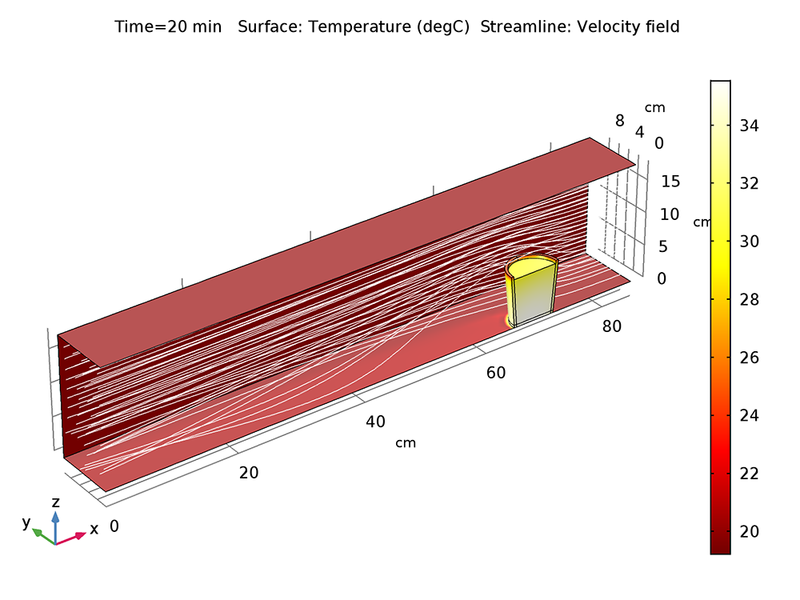 In the second part, the model is extended to include a fluid domain for the flow channel to compute the coupled temperature and velocity of the fluid assuming nonisothermal behavior. In the last part, surface-to-surface radiation is considered to see how significantly it contributes to the results. Temperature distribution in the heat sink attached to the chip. Temperature distribution in the heat sink attached to the chip.